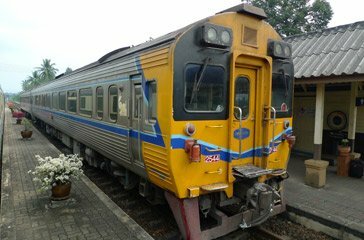 Train travel in Thailand | Train times & online tickets Bangkok to Chiang Mai, Ko Samui, Phuket, Nong Kai etc. Train travel in Thailand . . . Arriving in Bangkok by train from Singapore, you get a real sense of arrival. Note the picture of the King of Thailand, visible over the exit from the platforms. Thailand has one of the best metre-gauge rail systems in the world and train travel is easily the best way to get around & see the country. It's comfortable, safe, cheap & environmentally friendly. Unlike flying it's a genuine Thai experience which makes the journey as much a part of your trip as the destination. The train is the best way to travel between Bangkok & Chiang Mai and a train+ferry or train+bus combo is the best way from Bangkok to Ko Samui or Bangkok to Phuket or Krabi. There's also a Bangkok-Vientiane train service. Taking the train is a wonderful way to travel between Bangkok, Penang, Kuala Lumpur & Singapore, the 1,233-mile journey to Singapore takes 48 hours & costs a mere $60/£40 or so one-way. This page has schedules & fares for key train routes in Thailand, and explains how to buy tickets. 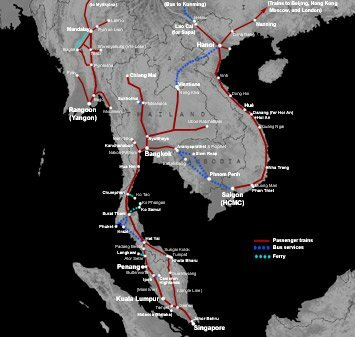 Click here for a map of train routes in Southeast Asia. 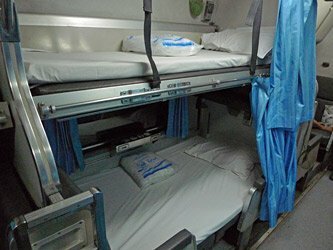 What are Thai trains like? Bangkok to Singapore by Eastern & Oriental Express deluxe cruise train from around $2,000. State Railways of Thailand (SRT), www.railway.co.th. For online booking see below. UK, US, Canadian, German, French, Italian & Japanese citizens can visit Thailand without a visa for up to 30 days. From November 2013 the 30-day limit applies to these nationalities whether entering Thailand by air or overland, for some time the limit has been only 15 days if arriving overland. To avoid any problems with airlines not allowing you to board flights to Thailand without an onward or return ticket, you can buy a tourist visa for 1,000 baht (£20), see www.thaiembassyuk.org.uk. Australians and most other nationalities only qualify for a 15-day visa-exemption if arriving in Thailand overland, 30 days if arriving by air, but you should check the current situation with your local Thai consulate. You can check train times in Thailand at the official State Railways of Thailand website, www.railway.co.th/main/index_en.html. Switch it to English by clicking the UK flag top right. Scroll down and click Timetable & Fares. It can help to know that the Northern Line means the line to Chiang Mai, the Southern Line means the line south to Surat Thani and Hat Yai, also the line to Kanchanaburi & the River Kwai. To buy tickets online see here. Thai rail expert Dave Bernstein has produced a superb PDF format timetable for the State Railway of Thailand which you can download, print out and take with you to help you travel around Thailand. It features timetables for all the main routes in English, maps, fares, refund & ticket purchase arrangements, details of bus/ferry connections and much more. Highly recommended! Download complete Thai train timetable. Click here for an interactive route map showing trains & connecting buses & ferries across Southeast Asia. For a detailed map of the Thai rail network see Dave Bernstein's excellent downloadable Thai Rail Timetable here. Suvarnabhumi airport: A modern rail link between Suvarnabhumi airport and central Bangkok opened in August 2010, see www.srtet.co.th or www.bangkokairporttrain.com. Fast trains run about every 15 minutes 06:00-24:00 from Suvarnabhumi Airport to the City Air terminal at Makkasan (22 minutes, 35 baht) and Phaya Thai Skytrain station in the city centre (26 minutes, 45 baht). There is interchange with the MRT (metro) at Phetchaburi station and with the Skytrain at Phaya Thai station. It does not directly serve Bangkok's main Hualamphong station. Don Muang airport: State Railways of Thailand trains between Bangkok and Ayutthaya, Chiang Mai & Nong Khai (for Vientiane in Laos) call at Don Muang station, right next to the old Bangkok Airport, about 50 minutes (22 km) from central Bangkok. However, most long-haul flights were transferred from the original Dong Muang Bangkok Airport to the new Bangkok Suvarnabhumi Airport in September 2006. You'll need to use buses for some routes where there are no trains, for example Phuket to Koh Samui. There are many bus operators in Thailand, you can check times & buy tickets online for many routes throughout Thailand using 12Go.Asia, a new site that is still expanding. 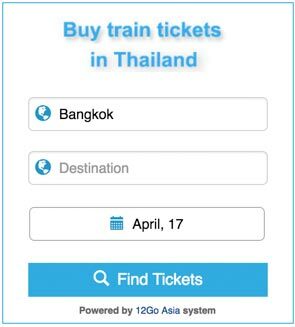 You can also use it to check train times in Thailand and Malaysia, and buy train tickets online. Do you need to buy tickets in advance? No, if all you want is a 3rd class local ticket such as Bangkok to or from Kanchanaburi, Ayutthaya, Hua Hin or Aranyaprathet as these are only sold at the station on the day. They cannot sell out! No, even for longer distance trains if you want to stay flexible and are prepared to risk the specific train or class you want being fully-booked. There are often places available even on the day or a few days before, at least outside peak periods, as long as you're prepared to take an alternative train, class or date if your first choice is full. However, sleepers on the best trains do sell out, often several weeks ahead at the peak Thai holiday periods such as New Year (30 December to 3 January) & Songkran (Thai New Year, usually 11-16 April). To be sure, book ahead if you can. 1st class sleepers usually sell out first, as there's usually only one 1st class sleeping-car on those trains which have them. Going to Singapore? If you want tickets all the way to Kuala Lumpur & Singapore, see the advice in the Bangkok to Singapore section. From 1 September 2018, booking for long distance journeys (for example, Bangkok to Chiang Mai or Hat Yai) will open 90 days ahead. Bookings for journeys that are between 25% & 60% of a long-distance train's total journey will open 30 days ahead. Bookings for journeys that represent <25% of a long distance train's total journey (for example Bangkok to Hua Hin on a long-distance express to Southern Thailand, or Hat Yai to Padang Besar on the Bangkok-Padang Besar train) will open only 1 day ahead. Tickets can be collected in Bangkok, Chiang Mai or Surat Thani, or for an extra fee sent by registered post to addresses worldwide. In Bangkok, you collect tickets from the 12Go.Asia office on the ground floor of the DOB building opposite Hualamphong station, open daily 10:00-20:00. Click here to see the DOB Building on Google Streetview. If you arrive at Hualamphong metro (MRT) station, use exit 1 and you will see the DOB Building just 30 metres away. Or walk out of Hualamphong mainline station and look for the DOB building across the road to the right of the line of shops. You can order Thai train tickets easily & cheaply online from reliable agency 12go.asia. When to book: You must book at least 3 days ahead but ideally less than 90 days ahead. They'll take bookings more than 90 days ahead but remember they can only buy tickets when the State Railways of Thailand open bookings. Their system shows live seat & berth availability so you can see which trains have places available and which are fully-booked, although they can't offer real-time online booking - you order online, their staff buy the ticket for you manually. (1) Bangkok: 12go.asia's collection counter is in the DOB building opposite Hualamphong station open 10:00-20:00 every day. There's no added fee for collecting here. 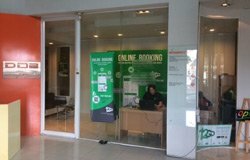 (2) Chiang Mai: You can collect tickets from the 24h Bossotel hotel reception across the road from Chiang Mai station, 70 baht fee, or from the station baggage room for 150 baht fee. 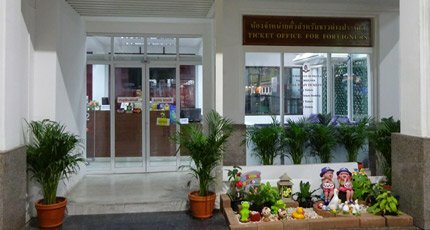 (3) Surat Thani: You can collect tickets from the station parcels office, open 24h. (4) Don Muang airport: You can collect here if heading north, open 09:00-20:30. 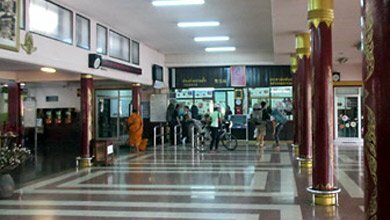 (5) Nong Khai: You can collect from the station baggage office, for a 150 baht fee. (6) Ayutthaya: You can collect from the parcels office. ...or have tickets sent to you worldwide: Alternatively, you can choose to have tickets posted to any address worldwide by registered express mail. This costs around 100 baht ($3) to addresses within Thailand or 1,500 baht ($43) to addresses worldwide including Europe, America & Australia. Obviously it's cheaper to collect tickets in Thailand if you can, but if none of the collection points work for you (for example, if you were going from Butterworth to Bangkok as there's no collection point in Butterworth), tickets will need to be sent to you. Payment & booking fee: 12go.asia charge the regular Thai Railways fare plus a pretty reasonable 250 baht ($7.50) booking fee and a small PayPal payment fee (3.4% + 11 baht). The price they show for each train includes the 250 baht fee but not the PayPal fee. You pay securely via PayPal, either using a credit card or your own PayPal account, or you can choose their Visa or MasterCard payment channel provided by Omise which is a bit cheaper. There's no additional delivery fee if you collect tickets in Bangkok or Chiang Mai, and just a small ($4) fee for collection at Surat Thani. Which trains & routes can 12go.asia sell? Most State Railways of Thailand routes, trains & classes are loaded on the 12go.asia system, but not every class on every route between every station, so bear that in mind. It won't sell tickets for local trains such as Bangkok to Kanchanaburi, Hua Hin or Aranyaprathet as you need to buy these on the day at the station. But the most popular longer-distance trains, routes & classes are bookable online. They can even sell the combined train+bus/ferry tickets from Bangkok to Phuket, Krabi, Koh Samui, Koh Phangan & Koh Tao (although only in the outward direction in the case of Phuket & Krabi), and they can book the International Express between Bangkok and Butterworth in either direction. 12go.asia can also book buses & ferries around Thailand, and now it can also book Malaysian KTM trains too. Tip: If you want one whole 1st class 2-berth compartment for two people, buy two 1st class tickets, selecting one upper and one lower berth, they will then book you together in one compartment. Make sure you select the option to book 2nd class if 1st class sleepers are full, see my advice on this here! Remember that you cannot board the train with the emailed confirmation voucher, you need to collect the actual ticket before you travel, or have it sent to you if you can't get to a collection point. Feedback is always appreciated. So far, seat61 correspondents report good & helpful service. Reliable Asian train & bus ticketing agency www.baolau.com also sells Thai train tickets through a direct connection to State Railways of Thailand's own online sales system. You print your own ticket, so ticket delivery is simplified, just be aware that only a certain percentage of all the berths or seats on each train is made available through SRT's online system. That means that trains or classes may be shown as sold out when in fact some seats or berths remain available, so it's worth checking 12go.asia as they can access all the seats and berths. Alternatively, you can book Thai train tickets over the internet from several other Thai travel agencies. These agencies will have the tickets waiting for you at your hotel in Bangkok for a small fee. Shop around to check what fees each agency charges before booking. Remember that reservations open 60 days (2 months) before departure, you can't book before then. www.asia-discovery.com is another reliable agency, recommended by a number of seat61 correspondents. www.royalexclusive.com & www.travelconnecxion.com/thailand_train_schedule.php also arrange train tickets for Thailand, the latter charging a 250 baht fee per ticket. In February 2017 State Railways of Thailand reinstated online booking at www.thairailwayticket.com with a small fee after two short-lived periods of offering online booking in previous years. We have yet to see how long this will last this time. However, reports so far suggest that it works, and accepts overseas credit cards. However, SRT only makes a small proportion of its total seats & berths available through its online system, perhaps just 15%, so you may see a train shown as sold out when in fact there are seats or berths left. If you have any problems, use 12Go.Asia as explained above, as 12go manually fulfil bookings so can access all the seats & berths through their systems, not just the small % which SRT make available online. You can also book direct with the State Railways of Thailand by emailing them at least 15 days, but less than 90 days, before your date of travel on passenger-ser@railway.co.th. If you choose email, your e-mail must include the journey, date, train number, departure time, class, seat or sleeper (upper or lower berth), number of passengers, your name and e-mail address. The email option usually works eventually, but it's often a slow process waiting for a reply from Thai Railways. Some people said they waited 2 weeks for a reply, another correspondent says it took Thai railways 18 days to reply, and one correspondent says he waited a month, so you have to be patient. You eventually will receive an e-mail confirmation, and you then collect and pay for your tickets at Bangkok Hualamphong station booking office at least 1 hour before departure, although a recent report says tickets for the sleeper to Nong Khai had to be collected before 4pm. The Thai railways charge a 200 Baht fee (£3 or $5) per email booking. Email bookings are only accepted more than 15 days before departure to give them time to respond. If you have any problems, or need to make a booking less than 15 days but more than 7 days before departure, try using 12Go.Asia as explained above. 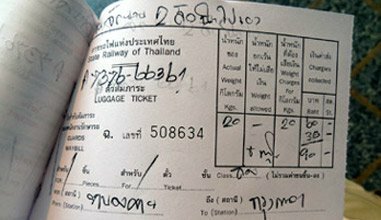 It's easy to buy tickets yourself at the station when you get to Thailand, but remember to take your passport, as it may now be required to buy a ticket. All long-distance express trains require a reservation, which can be made on the day of travel or up to 90 days in advance. 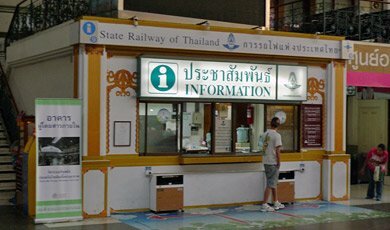 Reservations are computerised, and the booking office at any main station can reserve seats or berths for any journey in Thailand. Your ticket will have the train time and your seat or berth number printed on it. 3rd class local trains such as Bangkok-Ayutthaya or Bangkok-Kanchanaburi don't require a reservation, you just turn up, buy a ticket from the ticket office and hop on. Special ticket office for foreigners... Bangkok's main Hualamphong Station now has a special ticket office for foreigners to the left of the main ticket windows, open 06:00-20:00 every day. It's run directly by the State Railways of Thailand, and the helpful staff speak English and credit cards are accepted. They can sell advance tickets and tickets for immediate travel, combined train+bus/ferry tickets to Ko Samui or Phuket, and tickets for the weekend tourist train to the Bridge on the River Kwai. Take your passport, as it is now required to buy a ticket. Photo below courtesy of Tim Eyre. Main ticket windows... You can also buy from the main ticket office on the concourse, which is well organised. TV screens above each window show what tickets each window sells. Windows 15-22 are open for advance ticket sales daily from 08:30-16:00, see the photo below. The other ticket windows are open at all other times selling tickets for travel today. Ticket scalping by agencies? I've had at least one report that trains to Chiang Mai were 'full' when the traveller asked at the official booking office for a train in two days' time, but they were later directed to a travel agency on one of the upper levels inside Hualamphong station who sold them first class sleeper tickets on the train they wanted for an extra 700 baht each. Agencies sometimes buy up blocks of tickets to re-sell, a practice known as scalping. SRT should stop this, but in the meantime, if you find a train full it's worth asking a travel agency inside the station, if you're willing to pay the extra! Feedback appreciated. New Year (30 December to 3 January) & Songkran (Thai New Year, usually 11-16 April). 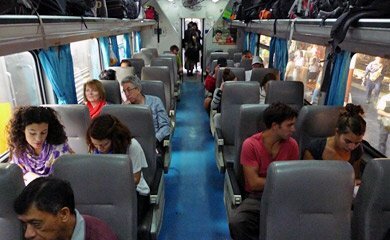 Normally there's no problem buying tickets when you get to Thailand, if you are flexible as to the exact day, train and class, although obviously if it's mission-critical that you travel on a particular train in a particular class on a particular date, you should pre-book using one of the methods suggested above. However, there are a few holiday periods when booking ahead is strongly recommended under all circumstances. The two biggest are New Year (30 December to 3 January) and Songkran (Thai New Year, usually 11-16 April). If you want to travel at these periods you should definitely pre-book, preferably on the very day booking opens (60 days before departure). You can call State Railways of Thailand by dialling 1690 within Thailand or + 66 2265 8080 from outside. It's reported that they are very helpful and are comfortable speaking English. You'll need to give your name, passport number and contact number. They'll give you a 10-digit reference number to collect your ticket at the ticket office, so have pen & paper handy. However, you must book by phone at least 5 days before travel and you have to pick up and pay for the tickets at the station within 24 hours. Feedback appreciated. As you can see from the example below, long-distance train tickets include a reservation on a specific train. It's for a 2nd class sleeper, upper berth, in coach 2, berth number 17. 'ANS40' is the coach type, in this case A for air-conditioned, N for day & night (meaning sleeper berth), S for second class, 40-berth type. ANF would mean air-conditioned 1st class sleeper, BNS would mean fan-cooled 2nd class sleeper. ANSH would mean air-con 2nd class sleeper, handicapped-accessible. The 'TRV' at the bottom is the issuing office, in this case Travex. Train information counter: In the photo above, it's on the far right-hand side of the concourse, with the white lightbox visible above it. They can give you a simple pocket timetable in English for any of the main Thai rail lines. Tickets for travel today: To buy tickets for immediate travel, go to any of the ticket windows each side of the King's picture in the photo above. 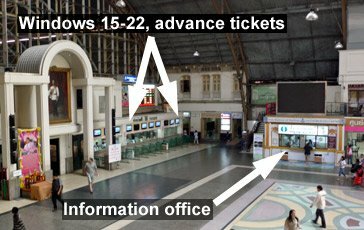 In theory, the TV screens above each window say for which trains that window is selling tickets, but most screens merely say 'All trains'. Advance ticket sales: To buy tickets from 1 to 60 days in advance, go to the Advance Booking Office, open daily 08:30 to 16:00. In the picture above right, head to the far right-hand corner of the concourse past the information counter and round the right-hand side of the concourse/platforms dividing wall towards platform 3. The Advance Booking office is tucked away on the right. When you enter, look for the machine issuing numbered queuing tickets, and wait till your number is called. The helpful staff will soon sort you out with a train ticket! Left luggage office: If you need to leave your bags somewhere, there's a privatised staffed left luggage office at the rear left-hand corner of the concourse, if you look at the photo of the station concourse above, the left luggage office is in the corner from which the photo was taken, at ground floor level. It's open 04:00 to 23:00 daily, price 20 baht for up to 100x30x40cm if <10Kg, 40 baht for up to 100x30x40cm and >10Kg, 60 baht for up to 150x60x80cm if <10Kg or 80 baht for up to 150x60x80cm and >10Kg, per item per 24 hours. They appear to measure weight in kilometres, but just go with it! Tip: Recent reports say the left luggage office may try to overcharge foreigners. If so, one correspondent reports an alternative. Leave the station and make an immediate left heading down the small street which runs down the east side of the station. The Train Guesthouse were happy to securely store backpacks for 25 baht a piece. Food & drink: There's a KFC outside the front of the station just outside the main front doors. If you're desperate for a cappuccino, there's a good coffee shop on the left-hand balcony (the one from which the photo above is taken) or a more basic Thai restaurant on the right-hand balcony. To buy supplies of drinks and snacks for the journey, there's a 'Tiffy Mart' in the far left-hand corner of the concourse towards the taxi rank. Taxis: The taxi rank is on the left-hand side of the station. In the photo above, you'd head towards the King's picture then turn left. Expect a taxi to any city centre hotel to cost around 50 baht (£1 or $1.50). Toilets & showers: The toilets and showers are beyond the information counter in the far right-hand corner of the concourse. They are of a reasonable standard, and a small fee is charged, 3 baht for toilets, 10 baht for showers. To ease congestion, State Railways of Thailand ultimately intend to move long-distance services out to a new terminal under construction at Bang Sue junction station, 7km North of Hualamphong station, and at some point - possibly late 2020 - all long-distance trains will start from there instead of Hualamphong. Suburban and short-distance trains will continue to run from Hualamphong, linking it to Bang Sue. The new Bangkok metro also links Bang Sue to the rest of Bangkok. For a metro map, see www.bangkokmetro.co.th. However, all long distance trains are still using Hualamphong at the moment. Luggage arrangements are really simple. You take your own luggage onto the train with you, and put it on any suitable luggage rack next to your seat or berth or inside your 1st class sleeper compartment. It will be quite safe, although some travellers take a bike lock with them to padlock it to the rack at night, just for peace of mind. You can put your daypack with camera, passport, and so on, in the berth alongside you at night. A very large suitcase would simply go on the floor alongside your seat. Luggage limits: Officially, every passenger is allowed one big suitcase and one smaller item although this is not rigorously enforced. Your bags won't be weighed, but in principle baggage limits are a generous 60 Kg (110 lbs) for 1st class passengers, 40 Kg (88 lbs) for 2nd class passengers and 30 Kg (66 lbs) for 3rd class passengers. Excess baggage: Large items in excess of the allowance such as golf clubs or additional suitcases can be carried in the baggage car if you buy a cargo ticket. You follow exactly the same procedure as for taking a bike, see the paragraph below. 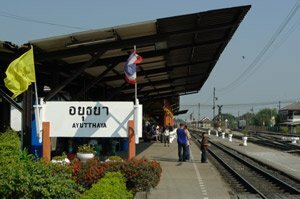 There are left luggage offices at Bangkok Hualamphong station (see above), Chiang Mai, Surat Thani, Ayutthaya and most other major Thai stations where you can leave your luggage for a small fee whilst you explore the town. You can take a bicycle or motorbike on any train on any route in Thailand for a small fee, except on the diesel railcar (DRC) trains which don't take bikes or any other sort of cargo (and also not on the Bangkok airport rail link) and except on the trains to and from Malaysia south of Hat Yai as there is no baggage car. First, buy your passenger ticket, either in advance or at the station on the day. You cannot pre-book your bike, even if you pre-book your passenger ticket. On the day of travel, go to the station with your passenger ticket, locate the cargo desk and buy a cargo ticket for your bike. The cargo desk will be a chair, a desk and a set of scales on or near the platform, the location varies from station to station and some smaller stations don't have a cargo desk. A cargo ticket costs around 90 to 130 baht (£2.00-£2.70 or $3-$5) for a bike, but can be up to 1230 baht for a motorbike. The bike price is a flat fee based on where the train is going, not on where you're going, so on a train going from Bangkok to Hat Yai, the cargo price is the same to Hua Hin as it is to Hat Yai. Part of the cargo ticket will be attached to your bike, the other part to your passenger ticket. If you arrive immediately before the train departs, or if there isn't a cargo desk at that station, you may be told to pay on the train. When the train is ready for boarding, you take you bike to the baggage car for loading. It's a good idea to provide something to secure your bike, a couple of luggage elastics or even just some plastic string picked up from one of the vendors on the platform, don't rely on this being provided. Ask if you can secure your bike to the inside of the baggage car yourself, which they usually allow, as otherwise they may just lean it against other cargo and it could be damaged when the train is in motion. Some 3rd class trains don't have a baggage car, so on these you'll have to manhandle your bike into a passenger carriage and stash it in the corridor next to one of the washrooms. Now take your seat in the train. At your destination, go to the baggage car, show your cargo ticket and collect your bike. There is nothing further to pay when you arrive. Traveller David Mitchell reports on taking a bike on a train in Thailand: "I can confirm that it is indeed possible to take bicycles on Thai trains, or at least the Bangkok to Chiang Mai route, though I’m sure it is similar for the others. You have to send the bike as cargo and it travels in the cargo/guards van. The procedure is to buy your ticket, then locate the cargo office where they will fill out a cargo ticket. They will attach part of the cargo ticket to the bike and part to your passenger ticket – the cost for a bike was 90 baht each way. You then have to drop off the bike in the cargo car yourself before taking your seat. At your destination you go to the cargo car and collect the bike – you will have to show your ticket & cargo ticket before they will release it. The cargo car sometimes gets full so it is worth turning up early to make sure that there is enough space in it to accommodate your bike." Traveller Saibal Chatterjee took a bike from Thailand to Singapore by train: "In April 2012 I set out to ride my bike from Chang Mai to Singapore. I managed to bike as far as Surat Thani but then fell sick due to heat & exhaustion. So I carried on my journey towards Singapore by train. 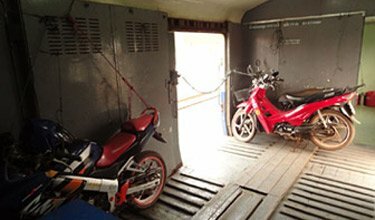 I took the overnight Thai Railways train to Hat Yai with my bike safe in the luggage compartment. From Hat Yai I took the Malaysian Railway train to Padang Besar and on to Kuala Lumpur (same train). I was allowed to take my bike on the Malaysian Railway train (at no extra charge). Initially I parked the bike between the space between the two toilets but the train conductor asked me to put it in the lockable luggage space on the other side of the compartment. I arrived at Kuala Lumpur station no problems. At Kuala Lumpur station I had to talk with the station manager to be able to take my bike on the train to Singapore. After a bit of sweet talk he allowed me to take my bike on the day (chair car) train to Singapore only if I bought a first class ticket (no extra charge for bike). I boarded the train and placed my bike between the last and the second last chairs. Later the ticket checker asked me to place the bike in the generator car so that it did not cause problems for other passengers. I did place my bike in the generator car and chained it with the door handle and reached Singapore without problems. The sale & consumption of alcohol has unfortunately been banned on SRT stations since July 2014, a knee-jerk reaction to a specific incident. You can no longer buy beer from a vendor or in the restaurant car. So far most reports suggest that the ban is not being enforced for passengers who bring their own. If you keep your beer out of sight in your baggage there usually seems little problem drinking it in the privacy of your own sleeper, although one traveller experienced a bag search and his cans of beer were confiscated. Feedback appreciated. Which class, 1st, 2nd or 3rd? Thai trains have three classes: 1st, 2nd, 3rd. 1st class only exists as modern air-conditioned sleeping-cars on overnight trains. 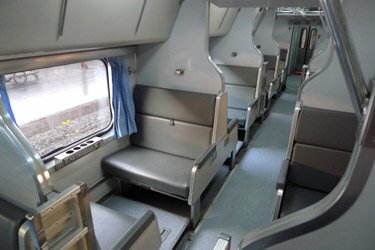 2nd class comes in seat and sleeper versions, in air-conditioned and non-air-con varieties, and is very comfortable especially on sleeper trains and the air-conditioned express railcars. Indeed, many experienced travellers including myself actually prefer a cosy & sociable 2nd class sleeper to a 1st class one. Even 3rd class is surprisingly clean and acceptable by European standards, and is an enjoyable way to travel on local trains for shorter trips. The photos below will help you decide which is best for you. The sitting and sleeper areas of all trains are non-smoking. 1st class sleeping-cars are air-conditioned with 9 lockable 2-berth compartments with washbasin opening off a side-corridor. Clean sheets, blankets, soap & towels are provided. 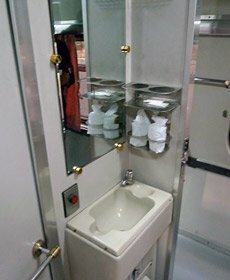 There's a western-style toilet at the end of the corridor and even a shower, with hot water in the new Chinese-built cars but luke warm water in the older cars. Berths are sold individually, so one ticket buys one bed. Solo travellers will share with another passenger of the same gender unless they pay for sole occupancy. The berths convert to a sofa for evening & morning use. 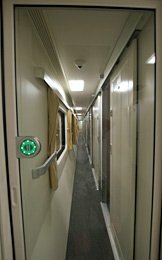 If there are 3 or 4 of you, you can book two adjacent 2-berth sleepers with an inter-connecting door (berths 1 & 2 connect with berths 3 & 4, berths 5 & 6 connect with 7 & 8, and so on). On key routes such as Bangkok-Chiang Mai, Bangkok-Nong Khai or Bangkok-Surat Thani-Hat Yai, a steward or stewardess from the restaurant car may come round and take your food & drink order, offering you a set menu with several choices, around 180 baht for dinner and 100 baht for breakfast. The meal will be delivered to your sleeper and if that suits you that's great, but it can be more fun and more social to go along to the restaurant car, where you'll get a wider choice - just be warned that as the attendants get commission, they have been known to deny that there's a restaurant car on the train when there is and you're free to go there if you want! The Man in Seat 61 says: "There's usually just one 1st class sleeping-car per train, so book early as the 1st class car often gets fully-booked a month ahead. If there are two of you, select one upper berth & one lower berth when booking online to get a whole compartment to yourselves. 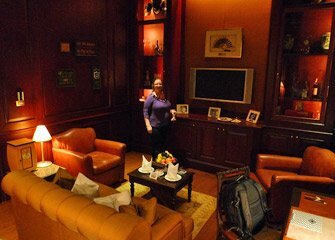 First-time visitors often obsess about 1st class, perhaps if I were on my honeymoon I'd go 1st class for the privacy - and the new Chinese 1st class looks very nice. But like many experienced travellers I actually prefer the more sociable open-plan 2nd class sleepers to rattling round in a 1st class compartment, especially if I'm solo. The 2nd class bunks have curtains for privacy at night and are fine for most travellers, even families with children. So don't feel you have to go 1st class. You really don't!" 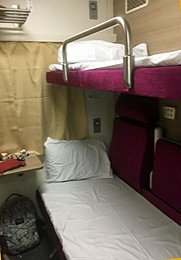 High-quality 1st class sleeping-cars built in China entered service on 11 November 2016 between Bangkok & Chiang Mai on trains 9 & 10 and Bangkok & Ubon Ratchathani on trains 23 & 24. These were joined from 2 December by trains 25 & 25 between Bangkok & Nong Khai (for Vientiane) and trains 31 & 32 between Bangkok & Hat Yai. Their layout is similar to the regular Thai type, with nine 2-berth compartments with washbasin opening off a side corridor. They feature TV information screens and power sockets for laptops & mobiles. There are toilets and a hot shower at the end of the corridor. A slightly higher fare is charged for travel in these new cars. See the video here or this article here. A 1st class sleeping-car boarding at Ubon Ratchathani, note the monk in his orange robes. 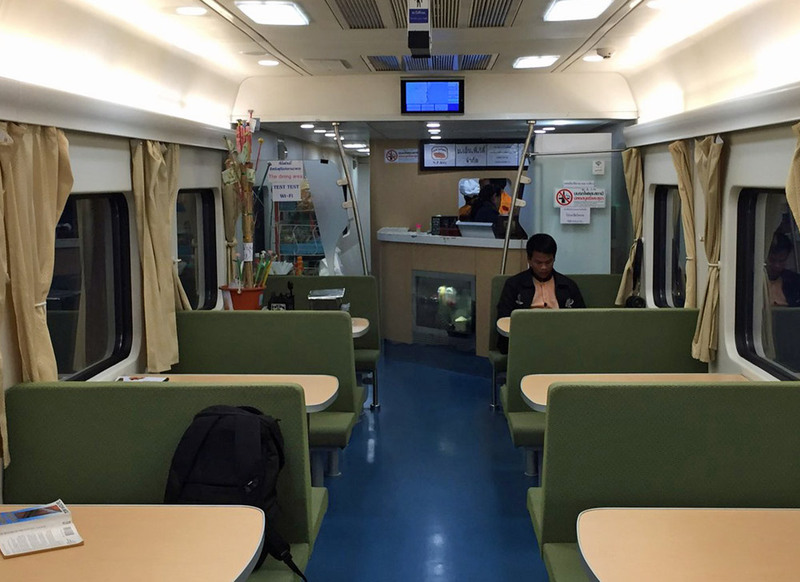 These new Chinese-built 1st & 2nd class sleeping-cars entered service in November 2016 on trains 9 & 10 between Bangkok & Chiang Mai & trains 23 & 24 between Bangkok & Ubon Ratchathani. Photos courtesy of Miriam Laffi & Andy & Fiona. Beds made up by attendant. 1st class 2-bed sleeper in seats mode. Larger photo. 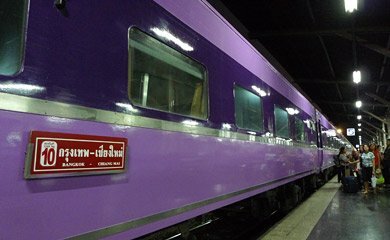 If your train has a 1st class sleeper, it will be of this regular Thai type, unless it one of the trains which have been equipped with new Chinese-built sleepers (trains 9, 10, 23, 24, 25, 26, 31, 32), or trains 51 & 52 which use a second-hand Japanese sleeping-car as shown in the next section. These cars have nine lockable 2-berth compartments opening off a side corridor. There are toilets are at the end of the corridor, along with a cold but still very welcome shower. 1st class 2-berth sleeper of the older type, in evening mode. You can see how the seat back hinges up to form the upper berth. Larger photo. The attendant will make up your beds. Courtesy of David Reason. Japanese 1st class sleeper on trains 51, 52. Train 51/52 between Bangkok & Chiang Mai is an exception. 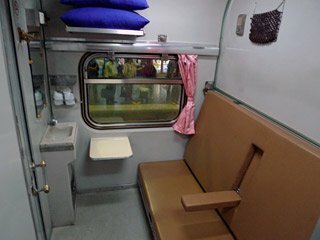 It has an ex-Japanese 1st class sleeper, which uniquely for Thailand has single-berth compartments, see the photos below. 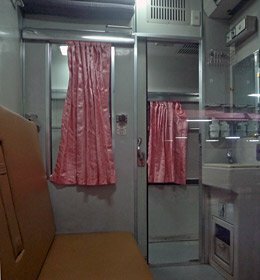 There are no 2-berth compartments on this train, but pairs of adjacent single-berth compartments have a connecting door, so berth 1 can be connected to berth 2, berth 3 to berth 4, and so on. Incidentally, until 10 November 2016, these cars were used on train 13/14, but from 11 November 2016 they are reassigned to train 51/52. 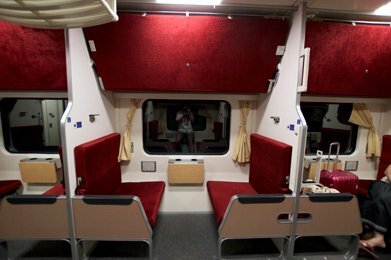 Train 51/52 has an ex-Japanese sleeping-car: Unlike all the other trains, trains 51 & 52 between Bangkok and Chiang Mai have an ex-Japanese Railways first class sleeping-car, which has 10 single-berth compartments. So if you book first class as a couple on this particular train, you'll get two separate single-bed compartments, there are no 2-berth compartments. The attendant will make up a mattress & bedding on the flat bed you see here. This car was reassigned from trains 13 & 14 to train 51 & 52 from 11 November 2016. Most western visitors use 2nd class sleepers, which are comfortable, safe and great fun. Berths are not in compartments, but are arranged 'open plan' either side of a central aisle. During the evening and morning part of the journey, seats are arranged in cosy face-to-face pairs on each side of the aisle, see the photos below. 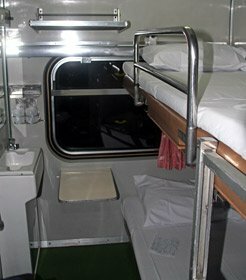 At night, the attendant makes up the sleeping berths by pulling together each pair of seats to form a lower berth, and folding an upper berth out from the wall above. He then arranges a mattress, pillow and fresh clean bedding on each berth, and hooks up the curtains on each bunk for privacy - see him do this in the video below! Luggage goes on the overhead racks or under the seats, or on the floor next to your seats. Some people bring a bike lock to chain it up for peace of mind, but you'd normally take daypacks with any valuables into the berth with you. 2nd class sleepers come in both air-conditioned and non-air-conditioned varieties, the air-con ones are usually cleaner and more modern, but the non-a/c ones have windows which open, better for taking photographs of the scenery. The fare for an upper berth is a fraction cheaper, but the upper bunks tend to be narrower. There's plenty of luggage room, take a bike lock if you want to chain up your luggage for peace of mind. Security is not a problem, it's a great way to travel which saves time even compared to flying, and saves a hotel bill too. Upper berths are fine for anyone up to 6' 2" tall, if you're taller than that you should choose a lower berth as these are significantly wider, allowing tall people to sleep comfortably on the diagonal. 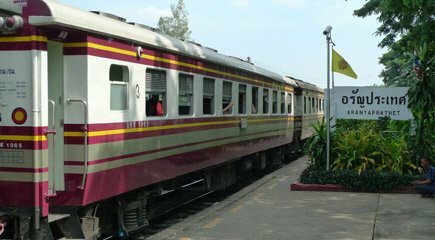 On key routes such as Bangkok-Chiang Mai, Bangkok-Nong Khai or Bangkok-Surat Thani-Hat Yai, a steward or stewardess from the restaurant car may come round and take your food or drink order, offering you a set menu with several choices, around 180 baht for dinner and 100 baht for breakfast. The meal will be delivered to your seat, and if that suits you that's great, but it can be more fun and more social to go along to the restaurant car, where you'll get a wider choice - just be warned that as the attendants get commission, they have been known to deny that there's a restaurant car on the train when there is and you're free to go there if you want! The Man in Seat 61 says: "The 2nd class sleepers are the best choice for most western travellers, and in fact I actually prefer them to the first class variety, especially if I'm travelling solo, and I'm not the only one who does! The air-conditioned sleepers are more comfortable and usually newer and cleaner, but the non-air-con ones have windows which open, better for viewing the countryside and taking photographs on the daylight parts of the trip." New high-quality Chinese-built sleepers came into service on trains 9 & 10 between Bangkok & Chiang Mai, and trains 23 & 24 between Bangkok & Ubon Ratchathani starting 11 November 2016. These were joined on 2 December by trains 25 & 26 between Bangkok & Nong Khai (for Vientiane) and trains 31 & 32 between Bangkok & Hat Yai. The layout of these cars is essentially the same as the previous most-modern type shown below. See the video here. A new Chinese-built 2nd class sleeper at Bangkok Hualamphong... Photos courtesy of Miriam Laffi & Andy & Fiona. Cosy bays of 2 seats each side of aisle. Seats pull together to form lower berth, upper berth folds from wall. Larger photo. 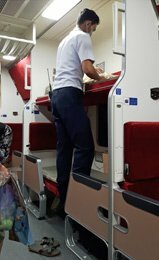 These modern air-conditioned sleepers now operate on trains 13 & 14 between Bangkok & Chiang Mai, amongst others trains. 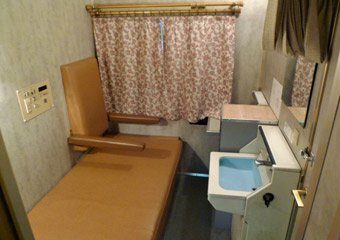 There is a washing area with two sinks and western & squat toilets at the end of the coach. Soap & toilet paper are provided. At night, upper & lower berths fold out, each with curtains for privacy. 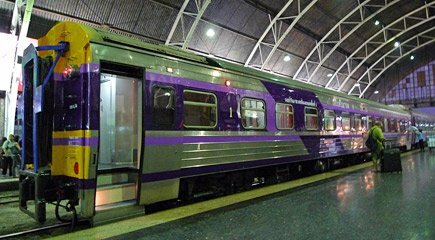 The modern cars previously running in trains 1 & 2 Bangkok-Chiang Mai were reassigned to trains 13 & 14 in November 2016. 2nd class sleepers are open-plan, with bays of seats either side of the aisle. By day, a pair of spacious armchairs for two people, very civilised. Who needs 1st class? Larger photo. These older air-conditioned sleepers operate on train 69/70 between Bangkok & Nong Khai, and on many other overnight express trains in Thailand. The layout is the same as the newer type shown above. 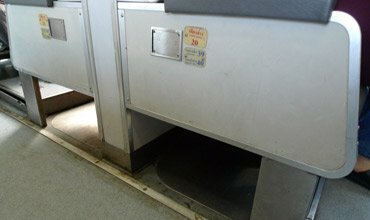 Trains 51 & 52 between Bangkok & Chiang Mai now use very comfortable air-conditioned sleepers bought second-hand from Japan. 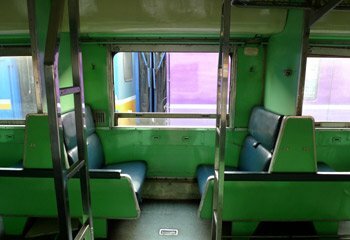 Unlike other Thai sleepers, the berths are arranged in bays of 4 in door-less compartments opening onto a side corridor. 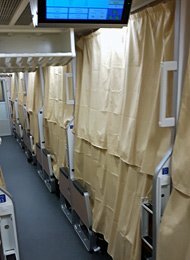 Each berth has its own curtains for individual privacy. Train 51/52 may also have a few Thai-type sleepers as well. These ex-Japanese cars were reassigned from train 13/14 to train 51/52 in November 2016. 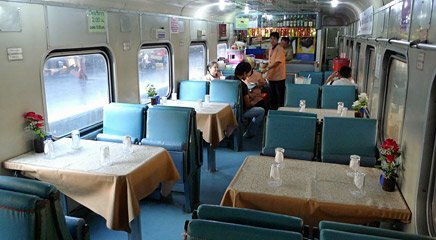 All the most important trains have a restaurant car, including trains 9, 10, 13, 14 Bangkok-Chiang Mai, trains 35 & 36 Bangkok-Hat Yai, trains 84 & 85 Bangkok-Surat Thani, trains 69 & 70 Bangkok-Nong Khai. 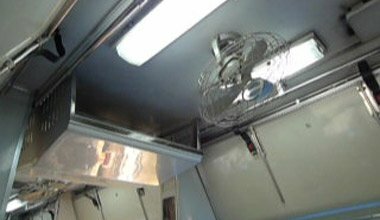 Some restaurant cars are air-conditioned like the one shown below, some are non-air-con. The food is remarkably cheap and good, a set meal costs around 150-200 baht (£3-£4 or $5-$6) and you choose from a leaflet with pictures & English captions. Beer is unfortunately no longer available as from July 2014. Travel tip: In a 1st class sleeper, an attendant may take your order and serve it in your compartment. If this suits you that's great, but it's more fun & more social to go to the restaurant car, where you'll get a wider choice - just be warned that as the attendants get commission, they have been known to deny that there's a restaurant car on the train when there certainly is and you're free to go there if you want! Click here for sample menu & food photos. 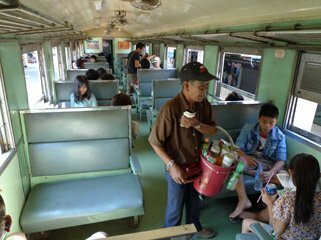 Food & drink vendors: On almost all Thai trains, even 3rd class ones, you'll find vendors selling fruit & soft drinks. Obviously, you can bring your own food and drink if you like, bought at the station or nearby supermarket. One traveller reports "We particularly enjoyed the restaurant car, the food was better than expected and they switched on the disco lights and 70's bogie music after the sun went down!" Alcohol: Sipping a beer on a Thai train has always been one of the pleasures of train travel, but sale and consumption of alcohol has been banned from July 2014 as a knee-jerk reaction to a specific incident. Restaurant cars therefore no longer sell beer. 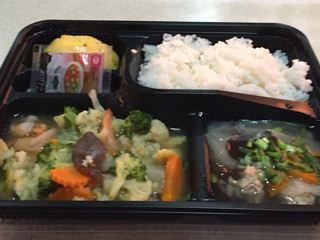 A set meal in one of the new Chinese-built restaurant cars used on trains 9 & 10 Bangkok-Chiang Mai, trains 23 & 24 Bangkok-Ubon Ratchathani, train 25 & 26 Bangkok-Nong Khai, train 31 & 32 Bangkok-Hat Yai. There a several choices of set meal costing about 210 baht. Courtesy of www.DiscoverbyRail.com. Larger photo. Train 7, the daytime Special Express DRC from Bangkok to Chiang Mai with 2nd class air-con seating. A Special Express DRC as used on trains 7 & 8 Bangkok-Chiang Mai & trains 40-43 Bangkok-Surat Thani. A pleasant and comfortable way to travel for long-distance daytime journeys, although slower than the express railcars. There are both air-conditioned and non-air-con varieties. The advantage of the non-air-con coaches is the open windows and unrestricted views, a breeze wafting in as the train clickety-clacks through the Thai countryside. Photos courtesy of Graeme Thorley. In spite of its name, 3rd class is a perfectly good option for short trips such as Bangkok to Kanchanaburi or Ayutthaya, as it's generally clean, not usually crowded outside the commuter peaks, unbelievably cheap, and sitting next to an open window as the train clickety-clacks through the countryside is a very pleasant experience. Although, 2nd class would be better for long trips such as Bangkok to Nong Khai or Chiang Mai. 3rd class usually has padded seats, but some older carriages have wooden seats. It's normally non-air-con, but air-con 3rd class exists on a few long distance routes. 3rd class seats, with soft drinks vendor. 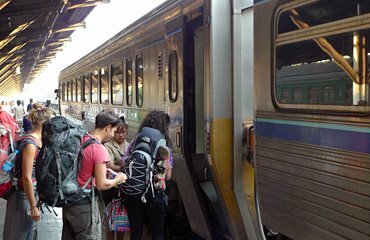 It's easy to travel from Bangkok to Chiang Mai by train, for just 881 baht (£18 or $25) one-way by overnight sleeper or 611 baht (£12 or $18) by day through the countryside on the air-conditioned express railcar. 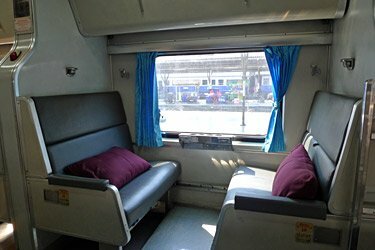 Travelling from Bangkok to Chiang Mai by sleeper is effectively faster than flying, far less hassle, far more environmentally friendly, more of a real Thai experience, and saves you a hotel bill, too. Think you don't see much from a night train? In fact, the scenery on the last third of the trip up into the mountains approaching Chiang Mai is particularly good, and even on the sleeper, watching the sunrise from the train in the morning is wonderful. 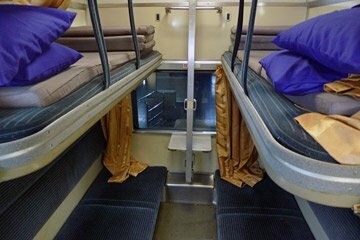 The new Chinese-built high-quality sleepers on trains 9 & 10 are excellent, and of course, the sleeper train itself is the scenery, a real Thai train with a chance to meet Thai people. ** Train 13/14 is the second-best sleeper train using the next most modern cars, and it passes the best scenery near Chiang Mai in daylight. *** Train 7/8 is the best daytime option, the air-conditioned express railcar. CHANGES IN NOVEMBER 2016: Trains 1 & 2 were replaced by new train 9 & 10 in the same timings using brand-new Chinese-built high-quality sleeping-cars. The modern cars previously running in train 1 & 2 were reassigned to train 13 & 14. The ex-Japanese Railways cars previously running in train 13 & 14 were reassigned to train 51 & 52. 1 = 1st class sleepers. S = 2nd class sleepers (air-conditioned). s = 2nd class sleepers (non-air-con). 2 = 2nd class seats. R = Restaurant car. 3 = 3rd class seats. DRC = Diesel Railcar express with 2nd class air-con seats, meals included, but no sleepers so not recommended for overnight journeys). You can check train times at the Thai railways website www.railway.co.th (see advice on translating it here). Many additional trains link Bangkok & Ayutthaya. Fares are in Thai baht. £1 = 43 baht. €1 = 39 baht. $1 = 33 baht. Children aged 0 to 3 and less than 100cm in height travel free, children aged 4 to 11 and under 150cm travel at reduced fare, children 12 years old and upwards (or over 150cm high) pay full fare. Sole occupancy of a 1st class sleeper: The 1st class fare shown above is for one person in one bed in a shared 2-berth sleeper. You can have sole occupancy of a 2-berth sleeper for an extra 500 baht (£10 or $16). 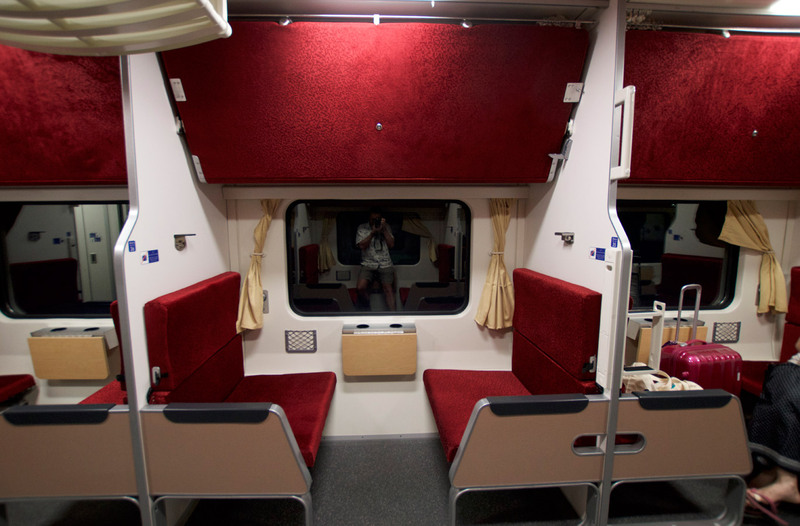 Note that the ex-Japanese 1st class sleeping-car used on train 13/14 only has single-berth compartments so the sole occupancy charge has to be paid, making the 1st class sleeper fare 1,953 baht (£40, $64) per person per compartment on this particular train. Upper or lower berths? The sleeper fares shown here are for a lower bunk on train 9/10, a narrower upper bunk is 50-100 baht less, and other trains cost a bit less. Non-air-con 2nd class sleepers (available on a few trains) cost 160-200 baht less than the air-con variety. You can check fares at www.railway.co.th (but do this by selecting 'timetables' as the fares shown at the bottom of each timetable page include the air-conditioning supplement, sleeper & special express supplements. If you select the fares option, the fares shown don't include those supplements. 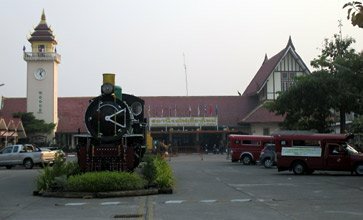 Chiang Mai station. Photos courtesy of Maureen Spencer. Chiang Mai ticket office & information desk. 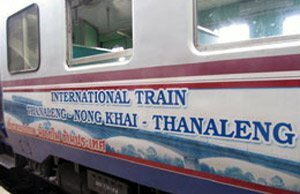 The international train from Thanaleng to Nong Khai. Photo courtesy of Glen Chivers. Here are trains between Bangkok & Nong Khai, near the border with Laos. If you're travelling into Laos, see the Laos page for information on the new Bangkok-Vientiane train service & on local transport across the Friendship Bridge between Nong Khai & Vientiane. 1 = 1st class sleepers. S = 2nd class sleepers (air-con). s = 2nd class sleepers (non-air-con). 2 = 2nd class seats. 3 = 3rd class seats. R = Restaurant car. DRC = Diesel Railcar express with 2nd class air-conditioned seats, meals included (no sleepers). * Recommended daytime train, air-con express diesel railcar. UPDATE: On 2 December 2016, train 69/70 was replaced by train 25/26 using brand-new high-quality Chinese-built 1st & 2nd class air-con sleepers - it's the best train to take. A train connection to Vientiane has been running since 2009: The Bangkok-Nong Khai railway has been extended across the Friendship Bridge into Laos, to a new station at Thanaleng on the Laos side of the Friendship Bridge some 13 km from Vientiane. Two daily local shuttle trains link Nong Khai with Thanaleng in each direction, one of them providing a connection out of / in to train 69/70 to/from Bangkok, to provide a cheap and comfortable Bangkok-Vientiane train service. See the Laos page for information on the new Bangkok-Thanaleng train service, and on local transport between Nong Khai or Thanaleng & Vientiane. Sole occupancy of a 1st class sleeper: The 1st class fare is for travel in a shared 2-berth sleeper. Sole occupancy is available for an extra 500 baht (£10 or $16). Upper or lower berths? 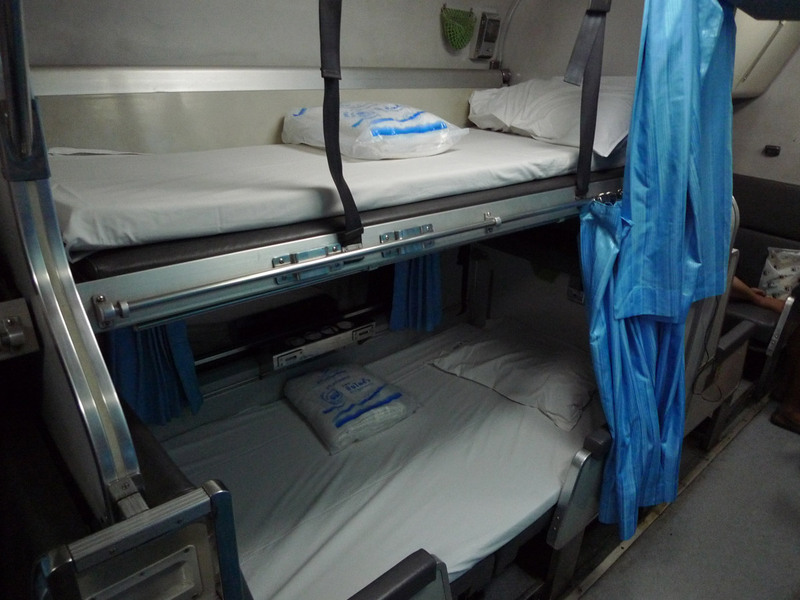 The sleeper fares shown here are for a lower bunk, a narrower upper bunk is 50-100 baht less. Non-air-con 2nd class sleepers (available on a few trains) cost 160-200 baht less than the air-con variety. You can check fares at www.railway.co.th (see the advice on translating it here). 1 = 1st class sleepers. S = 2nd class sleepers (air-conditioned). s = 2nd class sleepers (non-air-con). 2 = 2nd class seats. 3 = 3rd class seats. R = Restaurant car. DRC = Diesel Railcar express with 2nd class air-conditioned seats, meals included (no sleepers). * Recommended train for daytime travel, air-con express diesel railcar. ** Recommended overnight train. Train 23/24 uses new high-quality Chinese-built 1st & 2nd class air-con sleepers, introduced 11 November 2016. 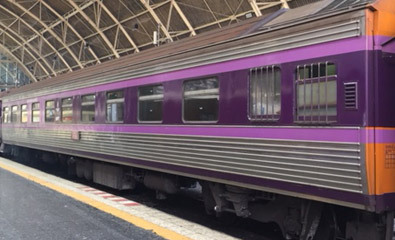 Traveller Ian Craven from Sydney reports: I recently travelled on the State Railways of Thailand on the Bangkok-Ubon run. We took daytime train 21, the express diesel rail car, in 2nd class air conditioned seats. We easily bought tickets the day before from a Bangkok travel agent for a very reasonable commission, about 50 baht. The train consisted of only three cars, and predictably we were the only farang on board. Train left just 5 minutes late, at 0550, and took at least an hour to get out of the suburbs of Bangkok, with the country eventually giving way to rice paddies as far as the eye can see; the train then climbs through some low hilly country with mainly teak plantations and orchards, and eventually gives way to a vast plain, again with rice predominate, along with sugar and banana’s, and all kinds of towns and villages, large and small. 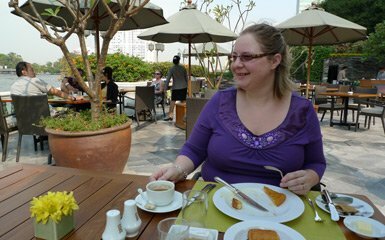 The seating was very comfortable, the air con just right (not too cold which is often the case), and the service impeccable. Despite a rather gruff visage, the conductor was in fact a very amiable fat controller, turned out in an immaculately pressed uniform. The train even features a 'trolley dolly', who serves breakfast (croissant & sweet bun), water, orange juice, tea and coffee (why is railway coffee uniformly bad everywhere in the world?!) 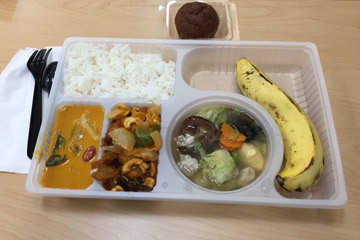 and lunch (like an airline pack featuring a small chicken curry and rice, and some kind of putrid fish that even the locals were poking at with disdain!). All this comes included in the price of the ticket. Train arrived in Ubon dead on time at 1410, despite some unscheduled stops along the way to let off passengers. While it is certainly not one of the great train journeys of the world, it is not overly long and provides some excellent views of Thai rural life, and is a cheap, efficient and very effective way to get to the southern Lao PDR frontier. I would highly recommend it to anyone. The international bus from Ubon-Pakse runs twice daily, about 3 hours, 200 baht. Aranyaprathet, 255 km from Bangkok, is just 6 km from the Cambodian border post at Poiphet from where buses run to Siem Reap and Battambang for onward bus or speedboat to Phnom Penh. See the Cambodia page for information about onward bus transport to Phnom Penh & Seam Reap (for the Angkor Wat temples) in Cambodia, and about onwards bus transport from Phnom Penh to Saigon in Vietnam. Trains 275-280 have 3rd class seats, but Thai 3rd class is quite clean and comfortable, and in fact a very pleasant way to travel, with vendors selling food & soft drinks. Train 279/280 is a diesel railcar. Children aged 0 to 3 and less than 100cm in height travel free, children aged 4 to 11 and under 150cm travel at half fare, children 12 years old and upwards (or over 150cm high) pay full fare. The best way to reach Kanchanaburi is by train, using the infamous Death Railway itself, for just 100 baht (£2 or $3)! 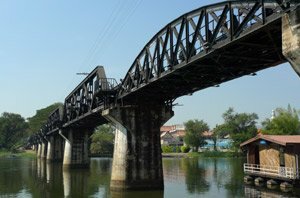 A regular State Railways of Thailand passenger service still runs over the 'Death Railway' from Bangkok via Kanchanaburi as far as Nam Tok, crossing the famous 'Bridge over the River Kwai' a few km beyond Kanchanaburi. 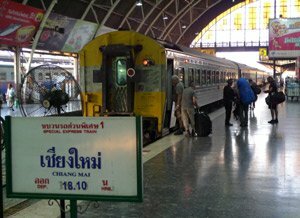 There are two trains a day from Bangkok Thonburi station (also known as Bangkok Noi, on the West side of the river in Bangkok) to Kanchanaburi and Nam Tok, calling at River Kwai Bridge station on the Bangkok side of the Bridge a few minutes after Kan'buri. The trains are 3rd class only, but don't let this put you off - they are clean and comfortable, and sitting next to an open window whilst clickety-clacking through the Thai countryside is easily the most pleasant way to reach Kanchanaburi. If you're coming from Singapore, Malaysia or Southern Thailand, you can travel direct to Kanchanaburi and the River Kwai Bridge without going into Bangkok - just change trains at Nakhon Pathom (64 km south of Bangkok), where the branch line to Kanchanaburi leaves the main line. There is also a special railcar (2nd class air-conditioned) for tourists at weekends, leaving Hualamphong station at 06:30 for Kanchanaburi at 09:25, Nam Tok 11:30, returning from Nam Tok at 14:40 and Kan'buri at 16:55 arriving Bangkok 19:30. Special fares apply, reservation required, see the Bridge on the River Kwai page for details. Sukhothai has no rail station, but you can take a comfortable train from Bangkok to Phitsanulok on the Bangkok-Chiang Mai main line, which is about 59 km from Sukhothai by bus. This train/bus combo avoids a nightmare 7 hours on a bus from Bangkok. The 08:30 or 11:50 DRC express railcars from Bangkok would be a good choice to reach Phitsanulok, see here for train times. 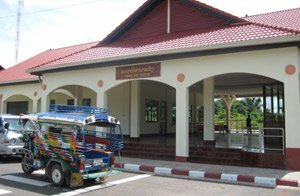 On arrival by train at Phitsanulok, simply ask one of the tuk-tuk taxis waiting outside the station to take you to the nearby bus station. Buses leave Phitsanulok for Sukhothai frequently between 07:00 and 19:00, fare around 40 baht or so, journey time 1 hour. One-time capital of the Sukhothai Kingdom, the UNESCO-designated ruins are 12 km outside Sukhothai town, easily reached by local transport. 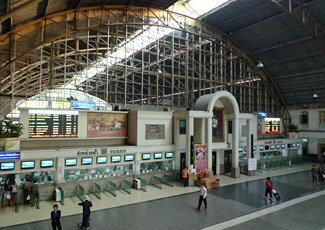 To reach Chiang Rai, first take a train from Bangkok to Chiang Mai, see above for train times. Ordinary (non-air-con) buses leave Chiang Mai Arcade bus station every hour or two from 06:00 to 17:30, journey time 3 hours 50 minutes, fare around 60 baht. Air-conditioned buses also leave from Chiang Mai Arcade bus station every hour or so from 07:00 to 17:00, journey time 3 hours 10 minutes, fare 102 baht. You'll find full details in the downloadable Thai timetable. Ayutthaya is the ancient capital of Thailand, with impressive ruins and temples to visit. It makes a great day trip from Bangkok, and it's really easy to get there by train. There is a local train from Bangkok's main Hualamphong station to Ayutthaya roughly every hour or so with basic but clean 3rd class seats, taking a leisurely 1 hour 45 minutes for the 71 km (44 miles). No reservation is necessary, just turn up, buy a ticket and hop on. 3rd class is not crowded outside peak times, and as a day tripper from Bangkok you'll be going in the opposite direction from the commuter crowds in any case. It's a very pleasant way to get there, sitting next to an open window with a cool breeze blowing in, as the train clickety-clacks along, and you'll often find vendors selling soft drinks & snacks on board. See www.railway.co.th for exact train times if you really feel you need them. The ruined capital is walking distance from the station. No reservation required - just turn up, buy a ticket & go. You can also travel between Bangkok & Ayutthaya on a faster air-conditioned express train taking only 1 hour 15 minutes, but these are less frequent. 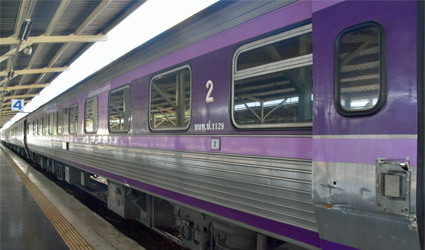 A reservation is necessary on express trains, but tickets to Ayutthaya on these trains are only sold on the day of travel at the station or online at www.thairailwayticket.com a maximum of 1 day ahead, you cannot pre-book more than 1 day ahead. This is so that short-distance passengers to Ayutthaya don't take up seats that could be used by long-distance passengers. Why not stop off at Ayutthaya on the way to or from Chiang Mai or Nong Khai, as trains between Bangkok and these destinations stop at Ayutthaya? It's easiest to use 3rd class local trains for the Bangkok-Ayutthaya section rather than booking a seat on an express, as the local trains are cheaper, more frequent and no reservation is necessary. Then see the Chiang Mai or Nong Khai timetable above for express train times Ayutthaya-Chiang Mai or Ayutthaya-Nong Khai. Ayutthaya has a left luggage office (on the platform, marked 'Cloak Room') where you can stash your bags for a 10 baht fee between trains. The market train line was temporarily closed for maintenance from May 2015 until March 2016, but is now up and running again. Step1, first take a little silver diesel railcar from Bangkok's Wong Wian Yai station to Samut Sakhon, known locally as Mahachai. Bangkok's Wong Wian Yai station is located on the west side of the Bangkok river, a 20 minute walk from the BTS Skytrain station at Wangwan Yai, see map of Bangkok showing stations. Trains run from Bangkok Wong Wian Yai to Mahachai roughly every hour from 05:30 until 20:10, journey time around 59 minutes, usually 3rd class only, fare 10 baht, distance 31.2 km (19 miles). 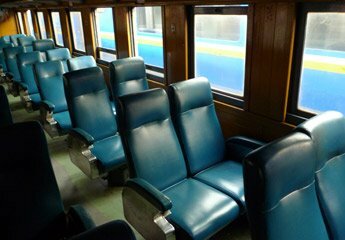 Most trains are non-air-conditioned with opening windows (better for photography), but you'll also find some 2nd class air-con cars on the 07:00 & 10:40 departures from Bangkok, plus a couple of later trains, with fare 25 baht. Step 2, you then cross the Tha Chin river by ferry to Ban Laem, 3 baht. The ferry takes just a few minutes. Step 3, on the other side, four trains a day run from Ban Laem to Mae Khlong (Samut Songkhram), departing 07:30, 10:10, 13:30, 16:40, journey time 1 hour, fare 10 baht, distance 33.6 km. Step 1, trains leave Mae Khlong (Samut Songkhram) at 06:20, 09:00, 11:30, 15:30 taking 1 hour to Ban Laem, 10 baht. Step 2, cross the river by ferry from Ban Laem to Samut Sakhon (Mahachai), 3 baht, journey time a few minutes. Step 3, trains return from Samut Sakhon (Mahachai) to Bangkok every hour from 04:30 to 19:00, journey time 59 minutes, fare 10 baht. See the downloadable timetable for a complete timetable. For more information, photos and a video, see www.nomadicnotes.com/travel-blog/maeklong-market-railway-thailand-the-train-that-goes-through-a-market. The trip makes an interesting excursion from Bangkok. 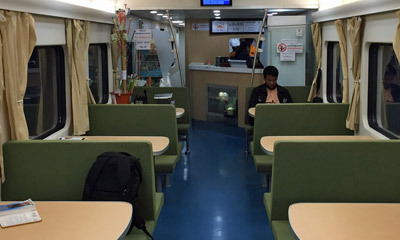 There are plenty of good air-conditioned trains from Bangkok to Hua Hin, Chumphon, Surat Thani & Hat Yai, with connections by ferry or bus to Thailand's popular beaches and islands such as Phuket, Krabi or Ko Samui. You can also travel to Malaysia & Singapore this way, by train from Bangkok to Penang, Kuala Lumpur and Singapore, see the Bangkok to Malaysia & Singapore page. This takes you along the west coast main line route. Alternatively, you can take a train to Sungai Kolok on the eastern end of the frontier with Malaysia. You can walk across the frontier and get a bus a few miles on to Kota Bharu. The railway station for Kota Bharu is Wakaf Bahru (3 miles or so from Kota Bharu), from where there are daily trains to Singapore and Kuala Lumpur via the scenic Jungle Line, see the Malaysia page. This route forms an interesting alternative to the usual mainline route via Padang Besar, although you need to be aware of the security concerns around Sungai Kolok at the eastern end of the Thai/Malay border. Malaysia time is one hour ahead of Thailand time, times shown for Padang Besar & Butterworth are Malay time. To/from Butterworth, you change trains at Padang Besar, hence the Butterworth time is in italics & (brackets). 1 = 1st class sleepers. S = 2nd class sleepers (air-conditioned). s = 2nd class sleepers (non-air-con). 2 = 2nd class seats. 3 = 3rd class seats. R = Restaurant car. 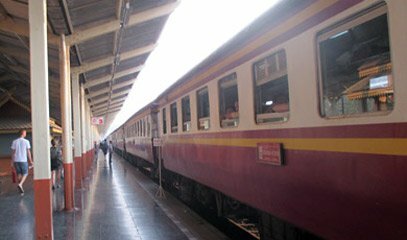 DRC = Diesel Railcar express with 2nd class air-conditioned seats, meals included, but no sleepers so not recommended for overnight journeys. ** Useful 3rd class train Bangkok-Hua Hin. No reservation required so cannot sell out - just buy a ticket on the day and hop on! *** Only two 2nd class sleeping-cars run all the way to/from Butterworth, the rest of the train only runs Bangkok-Hat Yai. IMPORTANT CHANGES IN NOVEMBER 2016: A new sleeper train with new high-quality Chinese-built 1st & 2nd class air-con sleepers has been introduced between Bangkok & Hat Yai as train 31 & 32. Train 35 & 36 is discontinued. The Bangkok-Padang Besar sleepers previously running in trains 35/36 now run as train 45/46 which is combined with train 37/38 between Bangkok & Hat Yai - passengers on train 45/46 can use the restaurant car on 37/38. Upper or lower berth? The sleeper fares shown here are for a lower berth on the best train, 31/32, a narrower upper berth is 50-100 baht less. Other trains cost a bit less. 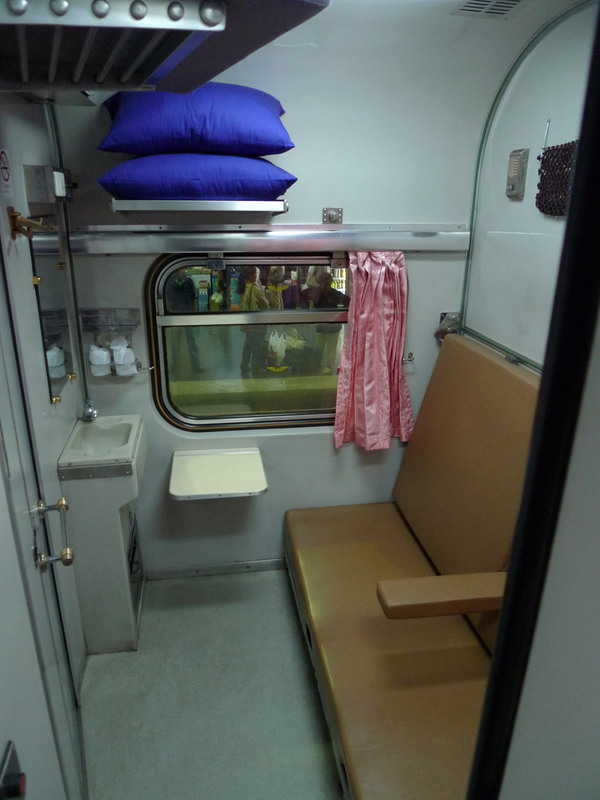 Non-air-con 2nd class sleepers (available on a few trains) cost 160-200 baht less than the air-con variety. You can check fares at www.railway.co.th (see the advice on translating it here). Security warnings in Southern Thailand... You may be aware of the security warnings for southern Thailand. These primarily apply to the eastern end of the Malaysia-Thailand border around Yala & Sungai Kolok, where there is a risk of being in the wrong place at the wrong time if you were to hang around. Bombs have gone off outside bars and police stations in Yala and Sungai Kolok, and the eastern Sungai Kolok-Yala-Hat Yai rail line has been affected on a number of occasions, so use this route with extreme care if at all. However, the Bangkok-Hat Yai-Penang-Kuala Lumpur-Singapore main line passes through the border at the western end which isn't as badly affected, and the British Foreign Office advice now formally recognises that the Hat Yai-Padang Besar railway is fine. Although I must make it clear that I'm no security expert, there are unlikely to be any problems simply passing through a small part of the less-affected area non-stop on board a train via the Singapore-KL-Penang-Hat Yai-Bangkok main rail line via Padang Besar. Although travellers should always take advice and be aware of the current situation. I certainly don't claim to provide current security advice! Simply take any train from Bangkok to Chumphon shown in the train times above, then hop on a ferry to Koh Tao, see the ferry times below. You can use 12go.asia to find combined train+ferry times. Ferry operators: LC = Lomprayah Catamaran (www.lomprayah.com); KTC = Koh Tao Cruiser; SEB = Songserm Express Boat (www.songserm-expressboat.com). KJCF = Ko Jaroen Car Ferry; NB = Night Boat. The Lomprayah Catamaran fare is 600 baht (£12 or $17) one-way. These combined train & ferry fares include the Bangkok-Chumphon train, bus transfer from Chumphon railway station to pier and the ferry to Koh Tao. They can be ordered online through reliable agency 12go.asia as explained above with ticket collection in Bangkok or postage to any address worldwide or of course they can be bought at Bangkok Hualamphong station. Children aged 0 to 3 and less than 100cm in height travel free, children aged 4 to 11 and under 150cm travel at reduced fare, children 12 years old and upwards (or over 150cm high) pay full fare. Find a hotel in Ko Tao. The train-ferry connections actually work better via Surat Thani and Ko Samui, even though it's the long way round as it avoids a 4am sleeper train arrival at Chumphon. To travel from Bangkok to Ko Tao via Surat Thani, see the Bangkok to Ko Samui section below, looking for the Lomprayah ferry option. Tickets for this route can also be ordered online through reliable agency 12go.asia as explained above with ticket collection in Bangkok or postage to any address worldwide. Just use 12go.asia to find the suggested train & ferry times. Travel by train from Singapore, Kuala Lumpur, or Penang via Hat Yai to Surat Thani, see train times & info Singapore-Malaysia-Surat Thani. Then hop on a daytime or overnight ferry from Surat Thani to Koh Tao, see the ferry times below. Ferry operators: NB = Night Boat. Fare: 500 baht. Tickets are sold at the pier. You can check ferry times at www.kohtaoonline.com. There are also ferries from Koh Tao to Ko Samui, see www.seatranferry.com and look for Seatran Express. Train+ferry to Ko Samui: Poster advertising the combined train & ferry service from Bangkok to Ko Samui. An excellent choice! It's easy to travel from Bangkok to Ko Samui or Ko Phangan using a combined train+ferry ticket. It's the safe, comfortable & environmentally-friendly way to travel, too, far better than cramped buses or short-haul flights. The overnight sleeper option takes no more time out of your holiday than flying and is a lot more fun, and far more of an experience. Simply take a train from Bangkok to Surat Thani. 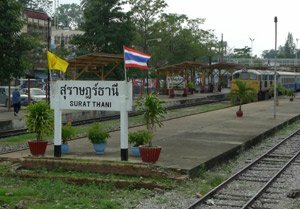 On arrival at Surat Thani railway station (located at Phun Phin, 14 km from Surat Thani town centre), shuttle buses meet the train and take you to the Don Sak ferry terminal 60 km east of Surat Thani. The bus is included in the train+ferry fare. Ferries sail every hour from Don Sak to Ko Samui, crossing time 1.5 hours, see the ferry information below. Some ferries continue to Ko Phangan. You can buy the combined train+ferry tickets at Bangkok Hualamphong station reservations office. Here is the recommended timetable via both the Raja and Lomprayah ferry companies. Just pick whichever looks most convenient. 1 = 1st class sleepers. S = 2nd class sleepers (air-conditioned). s = 2nd class sleepers (non-air-con). 2 = 2nd class seats. 3 = 3rd class seats. R = Restaurant car. DRC = Diesel Railcar express with 2nd class air-conditioned seats, meals included. The ferries shown here are operated by Raja Ferry, leaving from Don Sak pier. Others are operated by Seatran ferries from Ban Don pier. £1 = 43 Baht. €1 = 39 Baht. $1 = 33 Baht. Buy tickets from Bangkok Buy tickets back to Bangkok Remember to change the date at the top. Booking opens 60 days ahead.. These combined train+ferry fares can be ordered online through reliable agency 12go.asia as explained above with ticket collection in Bangkok or postage to any address worldwide, just use the links above. They can of course be bought at Bangkok Hualamphong station, but trains get fully-booked at times, so pre-booking is recommended. Tickets cannot be booked online direct from State Railways of Thailand. Find a hotel in Ko Samui. Step 1, travel from Singapore, Kuala Lumpur or Butterworth (Penang) to Surat Thani by train, see the Malaysia page for a timetable & fares. You'll need to stay overnight and take a ferry next morning. Surat Thani station is located at Phun Phin, 14km from Surat Thani town centre. Step 2, shuttle buses run to the Don Sak ferry terminal just outside Surat Thani. Ferries sail every hour to Ko Samui 06:00-19:00, crossing time 1.5 hours, see the ferry timetable information below. Step 1, take an afternoon or evening ferry & from Ko Samui to Surat Thani, see the ferry timetable below. Stay overnight in Surat Thani. Step 2, travel from Surat Thani to Butterworth (Penang), Kuala Lumpur & Singapore by comfortable train, see the Malaysia page for full details of times & fares. Several ferry companies operate from Surat Thani to Ko Samui, including the Seatran ferry (hourly sailings, 1.5 hour crossing), the Songserm express catamaran (1 hour crossing, 2 daily sailings), and the Songserm overnight boat. You can check ferry times and fares at www.seatranferry.com. The ferry fare is 110 baht (£2 or $3) one-way. A combined bus+ferry ticket from Surat Thani railway station to Ko Samui costs about 250 baht (£5 or $7). The Songserm overnight boat can be useful if you arrive in Surat Thani after the last Seatran ferry. It sails from the Ban Don ferry pier close to central Surat Thani at 23:00, and arrives Ko Samui 05:00. Upper deck tickets give you a mattress and pillow, the lower deck just has straw mats. For ferries from Ko Samui to Koh Tao, see www.seatranferry.com. This is best done by bus, with a couple of daily direct buses, use 12GoAsia to book a Phuket to Koh Samui bus online. 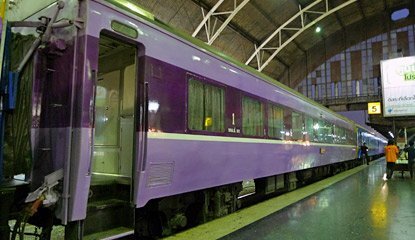 Train & bus from Bangkok to Phuket: Take the comfortable sleeper train from Bangkok to Surat Thani, then a bus to Phuket. Taking train+bus from Bangkok to Phuket is the comfortable & environmentally-friendly way to go, avoiding a gruelling 14-16 hour overnight bus journey in a cramped bus seat or an unnecessary short-haul flight. You simply take the comfy overnight sleeper train from Bangkok to Surat Thani, and next morning hop on an air-conditioned bus from Surat Thani to Phuket taking around 4-6 hours. The buses which accept the combined train+bus tickets are modern air-conditioned buses run by The Phantip Company, www.phantiptravel.com. There are actually around 14 buses a day from Surat Thani to Phuket between 05:00 & 17:30, run by various operators, you can check times at 12Go.Asia. If you buy separate train and bus tickets, the bus fare is around 220 Baht (£5). Phantip also operate an hourly minibus service between Surat Thani station and Phuket 06:00-17:00, fare 220 baht, journey 4 hours. * Minibus, not big bus, also operated by www.phantiptravel.com. You can check Surat Thani to Phuket bus times online at 12Go.Asia. These combined train+bus tickets can be ordered online through reliable agency 12go.asia as explained above with ticket collection in Bangkok or postage to any address worldwide, just use the links above. Or they can of course be bought at Bangkok Hualamphong station, but trains can get fully-booked at times, so pre-booking is recommended. Tickets cannot be bought online direct from State Railways of Thailand. Find a hotel in Phuket. Children aged 0 to 3 and less than 100cm in height travel free, children aged 4 to 11 and under 150cm travel at reduced fare, children 12 years old and upwards (or over 150cm high) pay full fare. Bus tickets to Phuket can also be bought at Surat Thani rail station for 220 baht each way. The 07:28 from Butterworth (Penang), change at Padang Besar, will get you to Hat Yai at 09:50. The 09:30 from Kuala Lumpur Sentral, 13:38 from Butterworth (Penang), change at Padang Besar, will get you to Hat Yai at 15:35. Step 2, travel from Hat Yai to Phuket by minibus or air-conditioned bus, you can check bus times and buy tickets for various bus operators using 12Go.Asia. Minibuses take 6 hours, fare around 350 baht. 1st class air-con buses take 7½ hours, fare around 344 baht. For example, buses run by Sritrang Tour leave Hat Yai bus station at 05:45, 07:45, 08:45, 09:30, 10:05, fare around 344 Baht (£7). Minibuses leave Hat Yai for Phuket regularly, and are probably the best bet for a connection off the trains. You'll find plenty of people trying to sell you minibus tickets at the station when you get off the train. Traveller David Maddox reports: "There are many people trying to sell you the minibus tickets to Phuket when you get off the train at Hat Yai. We went to two places. One pressured us into its shop and was asking for 650 Baht per person. If you walk out of the train station in Hat Yai and turn left and walk down past several restaurants and in one of the last buildings is a tour company that only charges 400 Baht (£8 or $13) per person and our bus was only locals. The minibus left from outside the agency, right near the station." Step 1, travel from Phuket to Hat Yai by bus or minibus, you can check bus times and buy tickets online for various bus operators using 12Go.Asia. Minibuses run regularly and take 6 hours, fare around 350 baht. 1st class air-con buses take 7½ hours, fare around 344 baht. For example, 1st class air-conditioned buses run by Sritrang Tour leave Phuket for Hat Yai at 07:30, 08:30, 09:30, 11:30, 12:30, 19:30 & 21:30 (check bus times locally). On arrival at the bus terminal in Hat Yai, take a tuk-tuk to the railway station. The 07:30 from Hat Yai, change at Padang Besar, will get you to Butterworth (Penang) at 12:30, change there for Kuala Lumpur arriving 18:47. The 13:05 from Hat Yai, change at Padang Besar, will get you to Butterworth (Penang) at 17:58 and Kuala Lumpur Sentral at 21:50. A ferry links Phuket and Ko Phi Phi. The ferry sails from Phuket at 08:30 and 13:30, and from Ko Phi Phi at 09:00 and 14:00. Crossing time 90 minutes. This is best done by bus, with a couple of daily direct buses, use 12GoAsia to book a Koh Samui to Phuket bus online. Combined train + bus fare Combined train+bus fare: 1st class sleeper a/c express train 2nd class sleeper a/c express train Bangkok to Phuket 1,589 (£32) 1,018 (£21). The buses shown here which accept the combined train+bus tickets are modern air-conditioned buses run by The Phantip Company, www.phantiptravel.com. They in fact run up to 12 daily buses between Surat Thani station and Krabi, see www.phantiptravel.com. These combined train & bus fares can be ordered online through reliable agency 12go.asia as explained above with ticket collection in Bangkok or postage to any address worldwide (they only sell the southbound direction) or of course bought in person at Bangkok Hualamphong station. Sleepers can get fully-booked at times so pre-booking is recommended. Children aged 0 to 3 and less than 100cm in height travel free, children aged 4 to 11 and under 150cm travel at reduced fare, children 12 years old and upwards (or over 150cm high) pay full fare. Bus tickets to Krabi can also be bought at Surat Thani rail station for 170 baht each way. Find a hotel in Krabi. Northbound, Singapore & Kuala Lumpur to Krabi: Travel by train from Singapore, Kuala Lumpur, or Penang to Hat Yai, see train times & info Singapore-Malaysia-Surat Thani.. Then take a bus or minibus from Hat Yai to Krabi. Minibuses leave Hat Yai for Krabi regularly, journey time 4 hours, fare around 300 baht (£6 or $9), probably the best bet for a connection off the train from KL. You'll find plenty of people trying to sell you minibus tickets at the station when you get off the train. Southbound, Krabi to Kuala Lumpur & Singapore: Minibuses run regularly from Krabi to Hat Yai, journey time 4 hours, fare around 300 baht (£6 or $9). Then travel by train from Hat Yai to Butterworth (Penang), KL or Singapore, see train times & info Singapore-Malaysia-Surat Thani. A train line links Bangkok with the popular resort of Pattaya. A 3rd class train runs Monday-Fridays, comfortable enough, cheap, no reservation is necessary, just turn up, buy a ticket and hop on, see the 3rd class photos here. 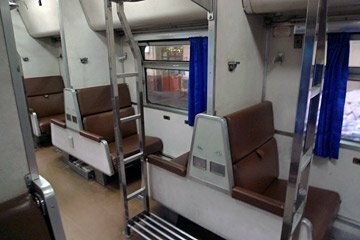 However, at weekends State Railways of Thailand run an air-conditioned Special Express railcar, with 2nd class reserved seats. Both types of train are a good and pleasant way to reach Pattaya. You can check these times at www.baolau.com. On train 283/284 = 3rd class = 31 baht. You sit where you like. On train SP 997/998 = 2nd class air-conditioned reserved seat = 170 baht. Buy tickets at the station, they cannot be booked online. 3rd class tickets for ordinary train 283/284 are only sold at the station an hour or less before departure, no need to book in advance, just turn up, buy and hop on. Tickets for Special Express 997 /998 can be booked ahead, but only at a station. Special Express 997 from Bangkok to Pattaya. If it looks a bit like a British class 158 train, that's because it is a 158, British-built to a similar design Photo courtesy of Paul Loynes. 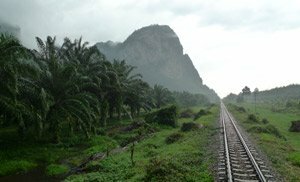 It's remarkably easy, safe and comfortable to travel from Bangkok to Malaysia & Singapore by train, over 1,200 miles for around £40 or $60 one-way, including sleepers, a real bargain. It's the environmentally sound way to travel, too. Trains run daily, and if done all in one go, the complete journey from Bangkok to Singapore takes two nights, though you can stop off wherever you like for as long as you like. I'd suggest stopping off at least in Penang and KL. Map of train routes in Southeast Asia. Bangkok to Penang, Kuala Lumpur & Singapore by cheap regular train (Malaysia & Singapore page). Bangkok to Singapore by luxury train (Eastern & Oriental Express page). 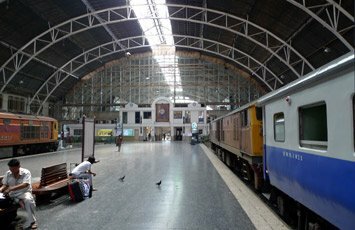 It's easy to travel between Bangkok, Siem Reap, Phnom Penh, & Saigon (Ho Chi Minh City) by train & bus, for details see the Train travel in Cambodia page. It's possible to travel overland between Bangkok, Moulmein & Yangon in Burma (Myanmar) by train & bus, for details see the Train travel in Burma page. Step 1: London to Moscow by train. Daily departures, 2 nights, from around £250 ($300) one-way with sleeper. Spend at least 1 night in Moscow. 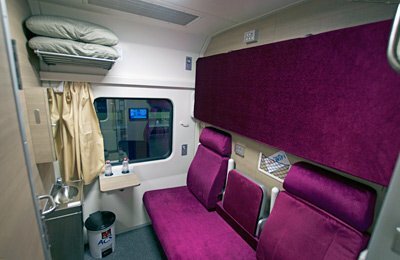 Step 2: Moscow to Beijing by Trans-Siberian Railway Two trains a week, 6 nights, from around £450 ($750) one-way in 4-bed sleeper. Spend at least 1 night in Beijing. See the Trans-Siberian page. Step 3: Beijing to Hanoi by train Two trains a week, 2 nights, about $320 or £220 one-way in soft sleeper. Spend at least 1 night in Hanoi. Step 4: Hanoi to Saigon by train Several trains daily, 2 nights. Why not stop off to see Hue or Hoi An? About $90 or £50 one-way in soft sleeper. Step 5: Saigon-Phnom Penh by bus Daily, 6 hours, $12. Spend at least 1 night in PP. Step 6: Phnom Penh-Battambang by train or bus, bus to the frontier, train to Bangkok. There aren't any travel agencies who can arrange the whole trip, so you will need to plan it out and arrange each stage of the journey yourself. It's an exercise in project management! Unless time is absolutely no object, you should book the key sections in advance through various travel agencies. Book Moscow-Beijing & Beijing-Hanoi through a local Russian agency such as Svezhy Veter or Real Russia as shown on the Trans-Siberian page & Vietnam page. Tickets for other parts of the trip, for example, Hanoi-Saigon-Phnom Penh-Bangkok can all be bought locally, as you go along. You'll need to pre-arrange visas for Belarus, Russia, possibly Mongolia, China & Vietnam, and in many ways complying with the various visa requirements (and in some cases, requirements for confirmed onward tickets to be held) is actually the biggest hassle, not buying the tickets for the trains, so check this out carefully using the relevant embassy websites. Where do you start? First, read through the seat61 pages linked above. Then sketch out your itinerary using a simple spreadsheet like this, deciding where and for how long you want to stop off. Next, check out the visa situation for each country. Finally, follow the advice on each seat61 page to buy tickets for each train journey that you want to pre-book. You won't be the first to travel between Europe and Southeast Asia overland this way, far from it. Check out this excellent blog from Tom Woods, "Woodlands to Woking", woodlandstowoking.wordpress.com, and Matthew Woodward's equally excellent blog from Edinburgh to Singapore www.matthew-woodward.com/edinburgh-to-singapore. Make sure you take a good guidebook. Easily the best guidebooks for the independent traveller are the Lonely Planets and Rough Guides. Both have stacks of practical information plus historical and cultural background. You won't regret buying either one of these guides! Alternatively, you can download just the chapters or areas you need in .PDF format from the Lonely Planet Website, from around £2.99 or US$4.95 a chapter. 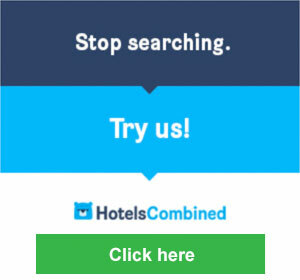 www.hotelscombined.com checks all the main hotel booking sites at once to find the widest choice of hotels & the cheapest seller. It's been named as the World's Leading Hotel Comparison Site in the World Travel Awards and I recommend it to find hotels in even the smallest places and to check that another retailer isn't selling the same hotel for less. www.booking.com is my favourite hotel booking site, and unless HotelsCombined throws up major price differences I prefer doing my bookings in one place here. You can usually book with free cancellation - this allows you to confirm your accommodation at no risk before train booking opens. It also means you can hold accommodation while you finalise your itinerary, and alter your plans as they evolve - a feature I use all the time when putting a trip together. 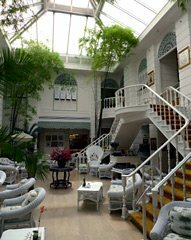 Check out the Shanghai Mansion (£40 or so a night for a double, close to Hualamphong station, excellent reviews), the Centre Point Sillom (£45 or so per night, excellent reviews, river views), the Chillax Resort (£55 or so per night, free wifi, swimming pool, great reviews in spite of the name! ), Inn a Day (£75 or so per night, rave reviews, close to palace & river, balconies to all rooms, free WiFi), Shangri-La Hotel (£140 or so per night, on the river, pool, rave reviews). Try the Sila Boutique B&B (£37 or so for a double, rave reviews, free WiFi, inside old city), La Pillow (£35 or so per night, great reviews, free WiFi, inside the old city), Villa Thapae (£65 or so per night, free WiFi, swimming pool, all rooms with balcony, rave reviews), Tamarind Village (£100 or so per night, spa, pool, poolside restaurant, tour desk, free WiFi, inside the old city and great reviews), De Naga Hotel (£95 or so per night, inside the old city, free WiFi, swimming pool, spa, great reviews), Rachamankha Hotel (£125 or so per night, pool, spa, free WiFi, great reviews). 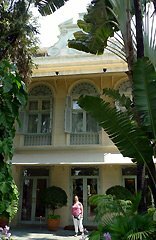 Known by locals (and taxi drivers) by its original name, plain Oriental Hotel, this is Bangkok's oldest and grandest hotel. Located on the banks of the Chao Phraya River, its outdoor restaurant tables line the riverbank, where they do a great evening buffet. Most of the rooms are now housed in two huge modern tower blocks, but hidden behind palm trees in the courtyard is the diminutive original block, today restored to within an inch of its life and housing just a few of the more expensive suites. 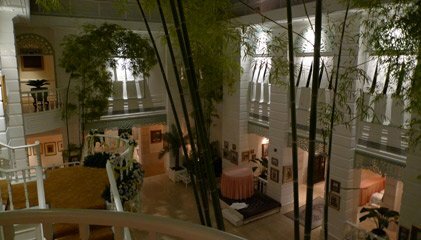 Above left, main hall in the original Oriental Hotel. Above right, the sitting room of the least expensive suite in this old block. www.hostelworld.com: If you're on a tight budget, don't forget about backpacker hostels. Hostelworld offers online booking of cheap private rooms or dorm beds in backpacker hostels in Paris and most other European cities at rock-bottom prices. Overland travel by train & bus around Southeast Asia is an essential part of the experience, so once there, don't cheat and fly, stay on the ground! But a long-haul flight might be unavoidable to reach Thailand in the first place. Never travel overseas without travel insurance from a reliable insurer, with at least £1m or preferably £5m medical cover. It should also cover cancellation and loss of cash and belongings, up to a sensible limit. An annual multi-trip policy is usually cheaper than several single-trip policies even for just 2 or 3 trips a year, I have an annual policy myself. Here are some suggested insurers. Seat61 gets a small commission if you buy through these links. In the UK, try Columbus Direct or use Confused.com to compare prices & policies from many different insurers. If you have a pre-existing medical condition or are over 65, see www.JustTravelCover.com - 10% discount with code seat61. If you live in Australia, New Zealand, Ireland or the EU, try Columbus Direct's other websites. If you live in the USA try Travel Guard USA. It costs nothing to take out an extra credit card. If you keep it in a different part of your luggage so you're not left stranded if your wallet gets stolen, this is a form of extra travel insurance in itself. In addition, some credit cards are significantly better for overseas travel than others. Martin Lewis's www.moneysavingexpert.com/travel/cheap-travel-money explains which UK credit cards have the lowest currency exchange commission loadings when you buy something overseas, and the lowest cash withdrawal fees when you use an ATM abroad. Taking this advice can save you quite a lot on each trip compared to using your normal high-street bank credit card! When you're travelling you often use free WiFi in public places which may not be secure. A VPN means your connection to the internet is encrypted & always secure, even using unsecured WiFi. In countries such as China where access to Twitter & Facebook is restricted, a VPN gets around these restrictions. And lastly, you can select the geographic location of the IP address you browse with, to get around geographic restrictions which some websites apply - for example one booking site charges a booking fee to non-European visitors but none to European visitors, so if you're not located in Europe you can avoid this fee by browsing with a UK IP address using a VPN. VPNs & why you need one explained. ExpressVPN is a best buy and I use them myself.